AZ: Describe your training style. MS: My training style has developed over the years but now it is basically gymnastics for the upper body and olympic lifts and deadlifting for the lower body. Mix in some single leg training and movement work and I am good to go. AZ: What are your current training goals? AZ: How do you manage to combine a lot of different training implements and still setting PRs? How do you approach programming? How often? How much? MS: As you know, I follow the 80% rule which makes everything better. I don’t consider the implement, but the movement. As long as the movements paired together don’t affect each other negatively I can work them concurrently. AZ: What is your favorite training tool, and why? 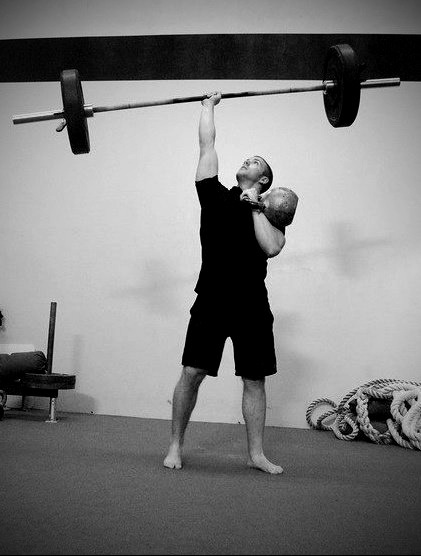 AZ: What is your latest discovery in strength training? MS: Thoracic Bridges: They have helped tons of people get instant benefits. MS: Health, Confidence, and Happiness. AZ: What is your favorite PR? I like the video of you pressing two 48 kg kettlebells. The first time I saw it, I was literally blown away. MS: That was a great one! I think my first gainer (single leg backflip) was pretty awesome. MS: Eat high quality food 80-90% of the time and don’t stress out over it. Don’t eat constantly just because you have access to it. MS: It’s counterintuitive, but don’t push so hard, make your strength training more like practicing free throws. Easier is better. AZ: Where can people find more information about you? That’s it. I hope you found out something new from this interview. Thanks to Max for providing the answers. And as always, thanks for reading. Hey Alex, I like your blog. I started training bodyweight calisthenics this year and I really like it. I am trying to mix in training some breakdance moves into my schedule (e.g. air swipe & 1990 to begin), without affecting my strength training & gains. Do you have any thoughts on how best to structure the training? Like alternate days, 3 days dynamic strength work + 3 days breaking (with some static strength work at the end of the session)? It depends on your recovery ability. I would start with 2 days of strength training and 2 days of breakdancing per week. If you see that you recover easily and getting stronger every session, feel free to try any 2+3 or 3+3. However, be aware that it can be too much. Anyway, I have no experience in breakdancing, so I’m making just an educated guess.